Indonesia is a big country. It’s got a population of 261+ million citizens. And while Lombok is home to only 3.1 million folks, it’s one of the brightest spots on the map. Mainly occupied by the Sasak people – Muslims – it’s also inhabited by the Hindu. These people have their own customs, traditions, and beliefs. Their religion has very little in common with what their neighbors believe in, but the two communities have found a way to coexist with each other. That’s the beauty of Lombok: it’s a place where different cultures come together, offering the visitors once-in-a-lifetime experiences. As for Gunung Pengsong, it’s definitely among finest landmarks on the island. Lombok has numerous temples. You’ll find them literally on every step of the way. At the same time, every single one of those Puras is special and has a strong historical background. If you spend some time in any of the temples that the Hindu people have built over the years (if not centuries), you’ll start to feel the love and care put into landmarks like Gunung Pengsong. Now, to make things clear: there’s a mountain in Lombok called Pengsong, and Gunung is a temple at the very top. So, don’t be confused when you get pictures of a mountain in the middle of a beautiful landscape J. It’s quite unique and will be a great place to visit on your trip. You’ll find this hill slash mountain in West Lombok Regency. We’ll discuss the best ways to get there at the end of this article, but for now, let’s just see what it’s all about. To get to the temple, you’ll need to climb all the way up to the top. Don’t worry, actual “climbing” won’t be necessary, as there are special steps made of concrete waiting for you once you arrive. Overall, there are 236, and that is still quite a “hike”. According to the local legends (and some historians), the Gunung Pengsong temple was built back in 1514, more than 500 years ago, by Ida Sebali, a Hindu Priest from Bali. Interesting fact: historically, Bali has always been the home of the Hindu people. By the way, if you’re a fan of exotic animals, you’ll be pleased to learn that this area is where the Indonesian macaque monkeys live. I bet you’ll see more than one of these creatures on your path to the temple. Pengsong is located at the height of 150 meters, give or take, and once you reach it, the view from up there will take your breath away. Nothing can compare to the feeling of being on top of the world, even though you’re technically not. Grab your camera or phone and make sure you capture this moment because it is truly special. Some folks hire guides for trips like this one, but they’re not really necessary. Enjoy this moment alone or with your loved ones – that’s priceless! If trekking is your passion, this mountain is perfect for that. Plus, up there, the air is super clean and you’ll feel like the “life force” is feeling up your lungs. I was standing right at the front of Gunung Pengsong and know exactly what I’m talking about. This is one of the cheapest landmarks on the island, as nobody will charge you for climbing those stairs. At the same time, the experience is definitely worth your while. Say, if you’re in Lombok for a week, a trip to the peak of the hill will be most suitable on the 4th/5th day. Keep that in mind and try to convince your friends to join, as it’s always more fun when you do these types of things with good folks next to you. The locals are calling Gunung Pengsong a sacred place and visit it every single year. For the tourists, it might not seem any different from all the other temples on the island, but it does have a unique background. Fact: once a year, the locals offer a cow to the temple (the gods that it was built for, to be more precise) as part of a sacred ceremony. The foreigners are allowed to witness this celebration and should arrive on the island sometime in December – that’s when it all usually happens. The ceremony is called Hari Rayapujawali and the Hindus never miss it. Some folks claim that Gunung Pengsong is the oldest temple in Lombok. There isn’t much you can do at this tourist spot except walking around, talking to the other visitors and communicating with the locals (I doubt they’ll understand English). The place is always clean and when you’re walking up the stairs, it feels like you’re about to enter the gates of Heavens or something like that. 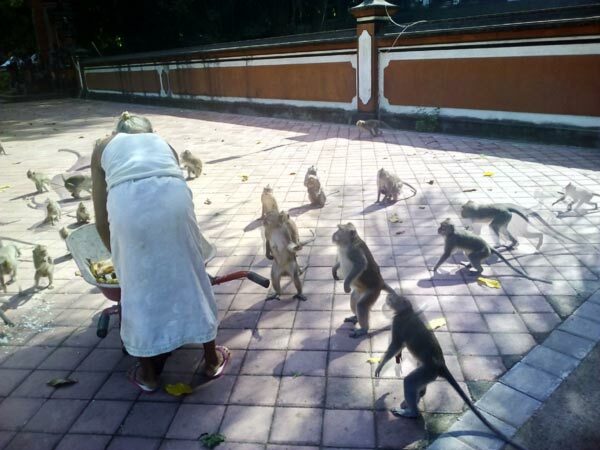 The monkeys I mentioned earlier aren’t afraid of people and treat the territory of the temple like it’s their second home. You’re more than welcome to take your kids on this trip. Accommodation-wise, this place is no good, meaning you won’t find a place to stay at the temple. But, thanks to the well-developed infrastructure, there are tons of options in the area. Lombok is famous for the good service and more than affordable prices on everything, hotels/guest houses included. As I said earlier, Gunung Pengsong won’t be able to entertain you for more than a day or two. But, it is a must-see spot on the island, especially if you’ve got some time to spare. If you’re renting a room nearby, don’t even bother calling a taxi or taking the bus – walking is the best option here. On the other hand, if you’re afraid you won’t make it to the top after a tiresome walk, then, by all means, let your legs rest in the back of the car J. Me and my friends had no trouble with that, but it doesn’t mean you have to follow our example. Pengsong is a combination of two words. “Peng” means a coin, while “song” means a hole, being holed. Together, they mean a coin with a hole. According to ancient manuscripts, the folks that came across this place found tons of gold and coin that were left on the island by the Japanese. So, what happened to those treasures, you might ask? I don’t know, and I highly doubt that the 500-year-old writings hold the answer. In any case, the temple still stands, and it carries a strong religious value. The Hindu people are just as strong in their beliefs as the Sasak people, and, despite the fact that they make up only 10% of the total population, they are here to stay. Again, this is a very sacred temple, one that should be treated with respect. And, there are 3 temples on this mount, not 1. Those include the Rinjani temple, Meranggu, and, of course, the Pengsong temple (AKA Pangsung). The latter is the most popular one; still, the others also deserve a visit. Here comes the important part: nobody will force you to climb all those stairs in one go. Take a moment to rest and admire the view if it’s too much. Who knows when you’ll be able to do that again, right? From Mataram, you’ll be able to get to the Gunung Pengsong temple in about 40 minutes. A taxi ride will cost you approximately 50-60K IDR (3, 5-4, 5 US dollars). Obviously, you can bargain, but I wouldn’t recommend that because the price is already quite low for the average tourist. The folks behind the wheel here know the island very well and will get you there in the blink of an eye. Renting is also an option. Cars and motorbikes are very cheap in Lombok – about 10 dollars a day. Take a look at the map below and make sure you learn the surroundings before getting on that plane because chances are, GPS won’t work while you’re on a trip. The finest route from the city is Cakranegara-Dasan Cermen-Bagek Polak-Perampuan – the temple is on the other side of that chain. The nature in Lombok is very beautiful, and a ride to Gunung Pengsong will be exciting. It’s very cool up there, as the large trees are keeping the sun from burning the concrete. Some of these trees have been around longer than the eldest members of the community. Add the monkeys running around and you’ll get a perfect “island temple” vibe. Wait, I forgot about public transportation. Well, in all fairness, it’s the least favorable choice. It’s slow, unpredictable, and no fun at all. Hire a personal driver and do this the right way! The monkeys might give you a big scare if you're all alone climbing up those stairs. They aren't violent, though, and never attack the humans. What can I say about this trip? It was off-the-hook! The taxi driver was a bit shady, but he did get us there in time. Plus, we managed to drop the price to 40 thousand Rupees. This review is taking me back to the day when I climbed all those 236 stairs and stood on top of the mountain. The feeling was priceless! There's a lot of sense in what you said about taking one single day to check Gunung Pengsong out. That's more than enough time to hike, climb, and go back to your hotel room. I don't really understand what is the point of spending all that time and energy just to see a temple. But I'll be damned because this trip was awesome!